When I was growing up, my younger sister was an enthusiast of jumping rope. It never really interested me except when someone who was really good at it did some fancy steps or tricks while jumping rope. So now that I am at an age where I have to be attentive to my weight I am beginning to consider the possibility of jumping rope myself. So, I am calling this blog “Jumping Rope for Beginners”. Let’s see if this will be for us and maybe for you, too. The American College of Sports and Medicine recommends skipping rope very highly. It increases aerobic conditioning. They suggest that it be done at least three times a week and for a duration of 12 to 20 minutes at a time. Because you are incorporating the largest muscles in the body you are aiding the heart in its’ ability to pump the blood through your body. So, by so doing you strengthen the most important muscle in your body. Rope jumping improves breathing efficiency. By increasing the body’s ability to exchange oxygen and waste gases you will increase stamina for work in many other areas. Your ability to do extended work or activity will be enhanced and increased in every area of your life. I need to run out and get a jump rope right now. It has been found in studies done by the Jump Rope Institute that jumping rope helps in developing the left and right sides of the brain. The benefits of this is increase of spacial awareness, improved reading skills, increase in memory retention, and brings about mental alertness. When jumping on the balls of your feet the brain and the body are constantly making fine adjustments to maintain balance. As a result dynamic balance, coordination, reflexes, bone density and muscular endurance is improved. By invoking the laws of circular motion and angular momentum they explain how calmness is brought about. The body’s motion is subject to the law that governs projectile motion while the rope is subject to the laws of angular momentum. By mastering the balancing of these two functioning at the same time the brain reaches a point of balance, or calmness, which it can maintain in other situations in daily life. Rope jumping helps improve your coordination. It makes you concentrate on your feet. Most of us never even consider our feet unless they ache or we have health related problems with our feet. 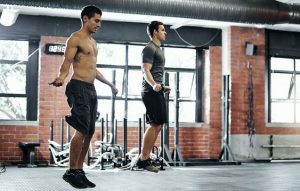 By jumping rope consistently you will become more nimble on your feet and have much more agility in all activities where your feet are involved. Another attribute of jumping rope is that it builds strength in the foot and ankles and in so doing decreases the possibilities of injury to your foot and ankle. It also improves the ability to make sudden changes in direction and stopping or starting. And because in jumping rope you are continually on the balls of your feet this will be carried over into other activities and sports that you participate in. This especially helps people who are flat-footed. Probably one of the greatest attributes is that it burns lots of calories. On an average, someone jumping rope for an hour will burn around 1300 calories. For a person who on average would consume 2000 calories per day you will have burned 2/3 of your daily calories in one hour. This is probably not convenient for most people, but if you can do 20 minutes you will burn well over 400 calories which is 1/5 of your daily calories. But another good thing is that it is aerobic and having raised your metabolic rate for 20 minutes means that for the next 8 hours your metabolic rate will he higher than it would normally have been had you not done the exercise. 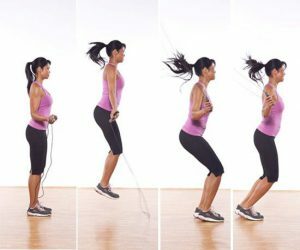 So, if you need to lose some weight it would be good to incorporate jumping rope with your diet plan to improve weight loss. The equipment in jumping rope is minimal. All you need is a jump rope. You can find these in a range of prices beginning as low as $5.00 on Amazon. I shall give you a link to the beginner jump rope on Amazon below. All you need is an area of approximately 8′ by 8′ and headroom of about 9′. If you live in a private home your garage is more than adequate. If you live in an apartment you may have to make adjustments. Watch out for over head fixtures such as light fixtures or sprinkler or smoke alarms. Even an inexpensive jump rope will last for a year depending on the environment it is used in. If you find that you need to begin some type of exercise regimen but are limited in the budget that you have to work with, then begin with jumping rope. Rope jumping fore beginners is truly inexpensive. The benefits ratio to expense is by far the best. A membership in a health club is much more expensive. And to utilize a health club you have to go there. Travel time will take away from exercise time, so the benefit is not nearly so good. You can always have your equipment with you if you jump rope. As we have shown you not only get physical benefits from jumping rope but you also get mental and emotional benefits as well. And you will not break the bank as far as equipment or membership investment. I am going to give you some links below to let you check out some jumping ropes. You may prefer a simple rope or if you wish maybe one with more adaptiveness. Check them out and may you have a jumping good time as you begin your adventure of loosing weight or getting in shape or just enjoying the fun of jumping rope. Go to our products page HERE. God bless you and prosper you as you go. For your enjoyment check this video HERE. Feel free to leave your comments below. I will reply. Go HERE and click on Vitamins and Supplements to get your health needs.